A 24 year old woman who had a stroke when she was a teenager will be running with her sister in the London Marathon to raise money for a charity dear to her. Olivia Parker Scott, from Acton, and her sister Victoria Parker have signed up to take part in the London Marathon this year to raise money for the Stroke Association. The charity is close to the family’s heart after Victoria had a stroke at the age of 18. Victoria was celebrating the end of her A-levels with friends on holiday in Spain when she felt ill.
Victoria was found to have two clots on the brain but the Hospital in Spain couldn’t confirm a stroke. After various tests they released Victoria to fly home. As soon a she arrived home she was taken to Charing Cross Hospital where they confirmed that she had a stroke caused by a hole in her heart. Victoria spent a month in Charing Cross Hospital as she needed a heart operation and intensive rehabilitation. The stroke left her with slurred speech and mobility problems. Six years on Victoria and Olivia are training hard having taken up running seriously last year. 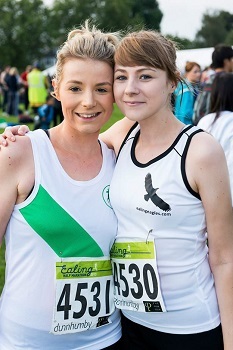 They have completed some 5k runs and did the Ealing half marathon in September last year. The sister’s are hoping to raise lots of money for their Marathon run.